On or about Wednesday, Sept. 26, through Saturday, Sept. 29, 8 p.m. - 8 a.m., CRC will begin milling along the westbound Greenway. 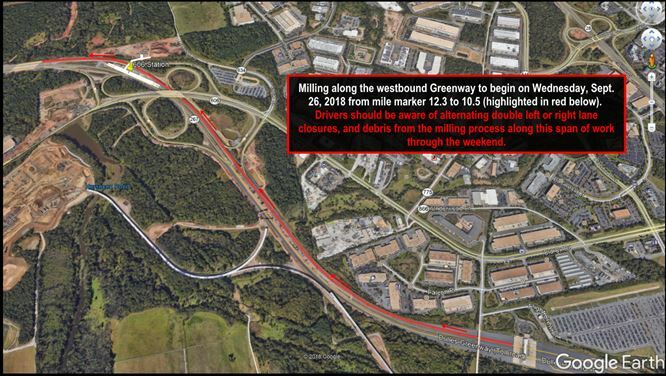 This work will involve alternating double left and right lane closures from mile marker 12.3, just west of the main toll plaza to 10.5, at Broad Run Bridge. It is expected that milling will continue through the end of the week and into the weekend as well. All traffic should be aware of lane closures and debris from the milling process along the span of work. See details below.